“Cold towel sir?” Is the perfect way to introduce a good feeling as far as I am concerned as I check in to the Jumeirah Lowndes Hotel on a hot Knightsbridge day. My good feel factor is lifted all the more as a coffee materialises next to my couch to keep me company as i wait a couple of minutes for the room to be ready. 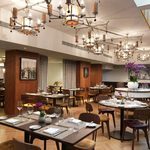 The Jumeirah Lowndes Hotel is an altogether different from prospect from its much bigger sister the Jumeirah Carlton Tower just around the corner. 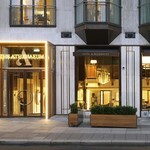 This is boutique luxury; a perfectly compact version of Jumeirah’s legendary hospitality wrapped up is a easily digestible format for those who prefer a quieter stay in one of London’s premier spots. I get the nod and suddenly I’m in residence. Just like that. It’s a small but elegant room, with plenty of signature Jumeirah furnishings; lavish bed, Temple Spa bathroom amenities, free wifi and Nespresso coffee machine. But there’s more. A knock on the door brings sweet pastries, then another knock heralds fresh fruit and water. All gratefully received. I spend the afternoon enjoying some more coffee in the lobby lounge before popping across to the Jumeirah Carlton Tower to use the gym facilities and work off a few calories in readiness for dinner tonight. In keeping with the boutique theme at Jumeirah Lowndes Hotel, the restaurant may be compact and comfortable but the dinner menu is far from that. A large family have commandeered a corner and are steadily working their way through every dessert on the menu, whilst the outside deck is doing good business with mint teas and snacks. “It’s our UAE crowd over to escape the summer heat” Danut tells me “always lively in the evenings” Danut becomes my go to man for menu suggestions. “grilled courgette and aubergine stack every time for me” he says confidently ” and the mushroom and spinach soup is always a favourite.” I go with his suggestions along with a dose of Chicken tikka marsala , (a Lowndes classic evidently) and a knockout Chianti da Vinci 2012. I have admit the tikka marsala is fairly ordinary considering the legendary billing, but Greg’s suggestions are epic as is dessert, a delicious bread and butter brioche with ice cream and custard; a total triumph for me. After dinner I join the UAE throng outside strolling along the leafy back streets before calling it a night and turning in. Morning dawns and I get a good morning name check down in the lobby. This is what warms me in boutique hotels, they have a personality and an intimacy with guests which cannot be replicated in larger properties. I go to my breakfast table and yet another coffee materialises before me, another example of boutique familiarity. 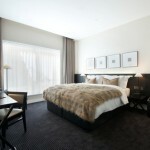 The Jumeirah Lowndes Hotel.is a perfect little luxury oasis in the heart of Knightsbridge. A haven hideaway that will protect and pamper you, but leave you to explore the delights of Knightsbridge and Kensington on its doorstep. There’s always that cold towel to come back to. 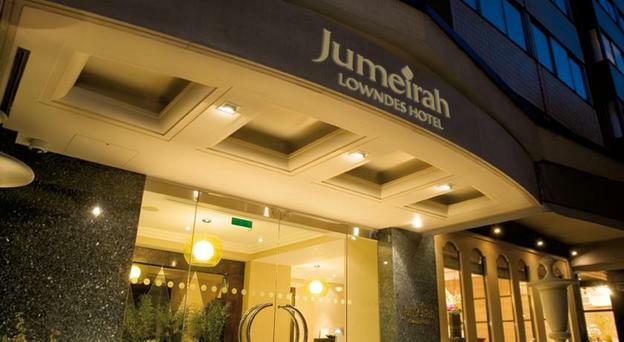 Superior room with breakfast at Jumeirah Lowndes Hotel is from £240 inclusive of VAT.